Deep green leaves. 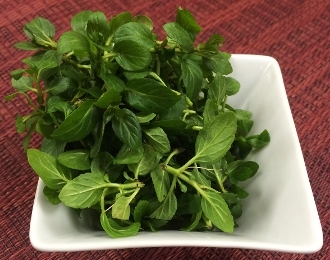 Strong, fresh taste of spearmint. Perfect garnish and flavor addition to all kinds of desserts, such as petite cakes, sorbet, tarts, and more. Also a great, herbacious ingredient and topping for special cocktails and lemonades.